Structured ‘Little Big Shot’ tote bag from Marc Jacobs. Crafted from textured crossgrain leather in a colour block design, the cream handbag features a dual-compartment structure bisected by a large zip pocket, with a further slip pocket to the interior. 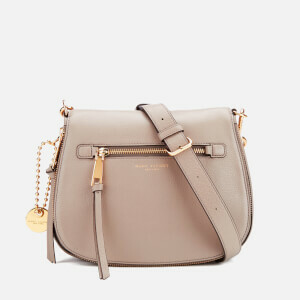 Two solid top handles and a detachable cross body strap offer versatile wear. A locket charm and signature double ‘J’ hardware add the finishing touches. Dimensions: H: 19cm x W: 25.5cm x D: 12cm. Handle Drop: 8cm. Strap Drop: 50cm.